Welcome to article43.com - a memorial to the layed off workers of (PRE SBC MERGER) AT&T, and the disappearing MIDDLE CLASS citizens of America. It is NOT endorsed or affiliated with AT&T or the CWA in any way. This sticky post was written the day we appeared on the internet in 2004. In addition to INFORMATION, resources and opinion for former AT&T workers DEALING WITH the EFFECTS OF LAYOFF and looking for meaningful employment, some articles here are meant to bring into awareness the LARGER PICTURE of corporate dominance of the UNITED STATES’ political and economic policies which brazenly DISREGARDS, disrespects and EXPLOITS worker, citizen and HUMAN RIGHTS under masks like FREE TRADE and the PATRIOT ACT - resulting in a return to a society of very rich and very poor dominated by a few very rich and powerful - whose voices are anything but - for the people. If left UNCHALLENGED, the self-serving interests of those in control may result in the end of DEMOCRACY, the end of the middle class, irreversible ENVIRONMENTAL damage to the planet, and widespread global poverty brought on by exploitation and supression of the voices of common people EVERYWHERE, while the United States turns into a REINCARNATION of the ROMAN EMPIRE. Author Thom Hartmann shares some history and outlines some basic steps to return our country to “The People” in his two articles TEN STEPS TO RETURN TO DEMOCRACY and SAVING THE MIDDLE CLASS. I support CERNIG’S idea for a new POLITICAL MOVEMENT - if not a revolution to cleanse our country of the filth ruling it - as we EVOLVE into a GLOBAL community - assuming we learn the THE LESSONS OF OUR TIME and don’t DESTROY CIVILIZATION first. Everything here can be viewed anonymously. Inserting or commenting on articles requires a free user account (for former AT&T employees with a real, non throw-away, email address.) Requests to the new user registration page are redirected to BLOGGED DOT COM’S site because most new signups I get are from COMMENT SPAMMERS and their ilk, so if you want to contribute, contact me through email, phone, or some other way. There’s no third-party scripts here like privacy-eroding WEB COUNTERS, hidden datamining widgets like Pay-Pal donation boxes, or AMAZON DOT COM tracking stuff. The RSS feeds are pulled by the server, and have no relation to anything you may be doing here. Standard Apache WEB LOGS of info like IP, and pages visited are rotated every few days, and used internally to check the web server’s performance. Logs of suspicious activity may be shared with law enforcement, or other ISPs, to deal with troublemakers. Nothing here is for sale, and donations are not solicited. If you get an email that claims to be from somebody here that’s anything but a request to post your article, or report suspicious activity (like logs sent to an ISP to report an attack) - it’s SPAM. I do not, and will not - ever - join the junk mail sender community. There are no mechanisms to prevent anyone from forging anyone elses email address in a “from” or “reply-to” mail header. For those of us whose email addresses are fraudently used, the best we can do is filter out NDR REPORTS. Per U.S.C. COPYRIGHT LAW - TITLE 17, SECTION 107, this not-for-profit site may reproduce copyrighted material not specifically authorized by the copyright owner. Such articles will either have a web link to the source, home page, and/or show credit to the author. If yours is here and you have a problem with that, send me an EMAIL, and I’ll take it off. Stuff I wrote carries a CREATIVE COMMONS LICENSE permitting non-commercial sharing. In addition, this site’s owner forbids insertion and injecting data of any kind - especially advertisements - into ours by any person or entity. Should you see a commercial ad that looks like it’s from here, please report it by sending me a tcpdump and/or screenshot in an EMAIL, then READ UP about how the PARTNERING OF INTERNET SERVICE PROVIDERS and companies like NEBUAD are DESTROYING INTERNET PRIVACY. Resumes of layed off AT&T workers are posted for free HERE. Information on the Pension Class Action Lawsuit against AT&T is HERE. 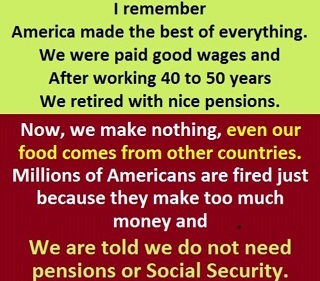 More pension-related articles are HERE. Links to some Telecom companies’ career pages are HERE. Click HERE to learn a little about Article 43 and why I loathe the CWA. Click HERE or HERE to learn what the CWA did when given a chance to do the right thing. Click HERE for a glimpse of undemocratic and hypocritical CWA practices. Click HERE for an article on Corporate Unionism. Click HERE for an article of AFL-CIO’s undemocratic history. If you’re looking for telco nostalgia, you won’t find it here. Check out THE CENTRAL OFFICE, BELL SYSTEM MEMORIAL, MUSEUM OF COMMUNICATIONS, TELEPHONE TRIBUTE, and THE READING WORKS websites instead. This site can disappear anytime if I run out of money to pay for luxuries like food, health care, or internet service. Discernment of truth is left to the reader - whose encouraged to seek as much information as possible, from as many different sources as possible - and pass them through his/her own filters - before believing anything. Today my country, your country and the Earth face a corporate holocaust against human and Earthly rights. I call their efforts a holocaust because when giant corporations wield human rights backed by constitutions and the law (and therefore enforced by police, the courts, and armed forces) and sanctioned by cultural norms, the rights of people, other species and the Earth are annihilated. If we do not hang together, we will surely hang separately. Solidarity has always been key to political and economic advance by working families, and it is key to mastering the politics of globalization. The impending credit crisis cant be avoided, but it could be mitigated by taking radical steps to soften the blow. Emergency changes to the federal tax code could put more money in the hands of maxed-out consumers and keep the economy sputtering along while efforts are made to curtail the ruinous trade deficit. We should eliminate the Social Security tax for any couple making under $60, 000 per year and restore the 1953 tax-brackets for Americans highest earners so that the upper 1%-- who have benefited the most from the years of prosperity---will be required to pay 93% of all earnings above the first $1 million income. At the same time, corporate profits should be taxed at a flat 35%, while capital gains should be locked in at 35%. No loopholes. No exceptions. 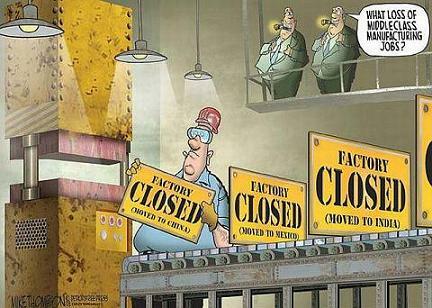 Congress should initiate a program of incentives for reopening American factories and provide generous sufbsidies to rebuild US manufacturing. The emphasis should be on reestablishing a competitive market for US exports while developing the new technologies which will address the imminent problems of environmental degradation, global warming, peak oil, overpopulation, resource scarcity, disease and food production. Off-shoring of American jobs should be penalized by tariffs levied against the offending industries. The oil and natural gas industries should be nationalized with the profits earmarked for vocational training, free college tuition, universal health care and improvements to then nations infrastructure. Many of the people who completely missed the worst recession since the Great Depression are trying to get out front and tell us about the next one on the way. The big item glowing in their crystal ball is an inversion of the yield curve. There has been an inversion of the yield curve before nearly every prior recession and we have never had an inversion of the yield curve without seeing a recession in the next two years. Okay, if you have no idea what an inversion of the yield curve means, it probably means youre a normal person with better things to do with your time. But for economists, and especially those who monitor financial markets closely, this can be a big deal. An inverted yield curve refers to the relationship between shorter-and longer-term interest rates. Typically, the longer-term interest rate - say, the interest rate you would get on a 30-year bond is higher than what you would get from lending short-term, like buying a three-month U.S. Treasury bill. We get an inverted yield curve when this pattern of higher interest rates associated with longer-term lending does not hold, as is now the case. For example, on March 27, the interest rate on a three-month Treasury bill was 2.43 percent. The interest rate on a 10-year Treasury bond was just 2.38 percent, 0.05 percentage points lower. This means we have an inverted yield curve. While this inversion has historically been associated with a recession in the not too distant future, this is not quite a curse of an inverted yield curve story. Most recessions are brought on by the Federal Reserve Board raising the overnight federal funds rate (a very short-term interest rate), which is directly under its control. The Fed does this to slow the economy, ostensibly because it wants to keep the inflation rate from rising. The higher short-term rate tends to also raise long-term interest rates, like car loans and mortgages, which are the rates that matter more for the economy. However, longer-term rates tend not to rise as much as the short-term rate. In a more typical economy, we might expect a 3.0 percentage point rise in the federal funds rate to be associated with a 1.0-2.0 percentage point rise in the 10-year Treasury bond rate. We get an inversion in this story when the Fed goes too far. It keeps raising the short-term rate, but investors in longer-term debt think that they see an end in sight to rate hikes and a reversal on the way. If the short-term rate is going to be falling to 2.0 percent or even lower in future months, then investors would welcome the possibility of locking in an interest rate like today’s 2.38 percent on 10-year bonds, even if it means foregoing a slighter higher short-term rate at the moment. That’s pretty much the story we have today. Since December 2015, the Fed has raised the federal funds rate from essentially 0 to 2.5 percent. With little evidence of inflation and some signs of a weakening economy, many investors are betting that the Fed has stopped hiking rates and will soon be lowering them. This hardly means there will necessarily be a recession. It is also worth noting that interest rates in the US are notably higher than in other countries, which do face a recession or near recession conditions. While the US 10-year Treasury bond pays 2.38 percent interest, a 10-year French bond pays just 0.31 percent. In the Netherlands, the interest rate is 0.13 percent, and in Germany, you have to pay the government 0.07 percent annually to lend them money. The extraordinarily low long-term interest rates in other countries puts downward pressure on interest rates here, which is another factor in our inverted yield curve. The weakness of economies elsewhere does mean trade is likely to be a drag on growth in the immediate future, but it does not mean a recession. To sum up the general picture, the U.S. economy is definitely weakening. The tax cut did provide a boost to growth in 2018, as shareholders spent much of the money they were given from the corporate tax cut. But there will be no additional boost in 2019. There was no investment boom to give us a big push going forward. Also, the rise in mortgage interest rates last year, following the Fed rate hikes, slowed housing. As noted, trade is a drag on growth. With Republicans again concerned about deficits, since they got their tax cuts, we can probably expect some cuts in government spending that will also dampen growth. However, with wages growing at a respectable pace, and job growth remaining healthy, we should see enough consumption demand to keep the economy moving forward. That means slower growth, but no recession. People should not spend time worrying about the curse of the inverted yield curve, at least not unless something else bad happens to the economy.